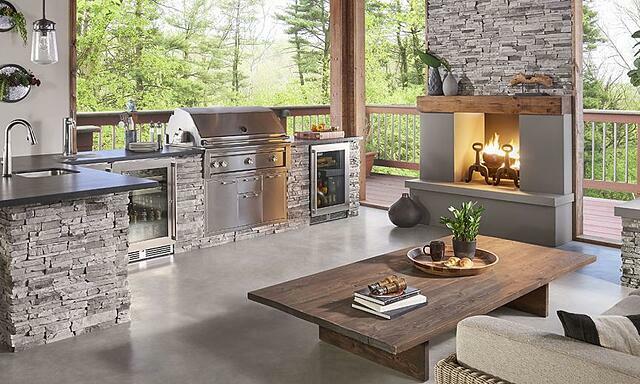 Start planning by first thinking about where you'd like your outdoor kitchen to be located. With an idea in mind, how you would like to use your kitchen will help to determine the dimensions. When you cook inside, what components are you always using? Are you always getting into the refrigerator, washing fresh produce at the sink, using all of your stove's burners at once? Thinking about how you utilize your current kitchen will help you decide what your essentials are that will need to be factored in to the outdoor space. Perhaps you'd like to add something you don't already have inside, such as a pizza oven, built-in grill, or beverage refrigerator. Once you have your list of must-haves, consider where your current utilities are located in conjunction with your desired outdoor kitchen location. Depending on what you would like to install, you may need to run electrical, gas, and water lines, so keeping them close to a current source will allow for an easier, more cost-effective process. With all of these in mind, it's time to plan the details. 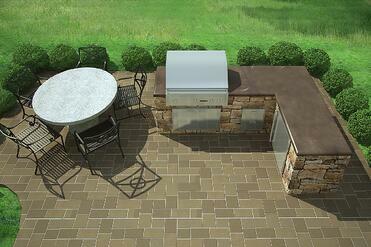 How do you want all of this laid out in your outdoor kitchen? Is your plan conducive to traffic flow if others are assisting in the kitchen or coming through to grab a fresh drink while you are cooking? Does your kitchen leave enough space for your dining area and chairs? You could have the most beautiful kitchen, but without a comfortable area to enjoy the fruits of your labor, it will be nothing more than an extra cooking space. Designing the perfect outdoor kitchen for your home is exciting, but can quickly become overwhelming when all of the small details come into play. We offer professional services to help design the outdoor kitchen of your dreams, and you can take the first step in creating your outdoor luxury retreat by using an outdoor design tool. For those who want a quicker turnaround, we offer a selection of pre-designed, ready-to-install Signature Kitchens that come with customization options to truly make the space your own. Whether you decide to design from scratch or install a pre-designed modular kitchen, contact us today and start enjoying your outdoor space.